In an unanimous decision, on Tuesday night the Oakland City Council voted to ban of sales of flavored tobacco products, including menthol cigarettes, in Oakland. According to a proposal published by the city of Oakland, the ordinance will lower tobacco use among young people and people in the African American community. The ban will prohibit retailers (as well as their agents or employees) from selling or offering to sell flavored tobacco products, such as menthols and “vaping” liquid. The ordinance will not ban the smoking or vaping of flavored tobacco products in Oakland. It will take effect in 2018. Councilmembers Annie Campbell Washington (District 4) and Larry Reid (District 7) had led the proposal for the ordinance. During the meeting, Campbell Washington leaned forward, holding her head in the palm of her hand, and listened to about 12 speakers who defended or attacked the ordinance. Reid kept his head down as he read or wrote notes. Five people spoke against the ban, saying that the city’s ordinances must make a distinction between cigarettes and liquid for e-cigarettes. The speakers argued that “vaping” is an alternative for smoking and a way for people who smoke cigarettes to stop smoking tobacco. E-cigarette liquid is generally made out of glycerin, water, propylene glycol, flavoring, and nicotine, which is optional. Carrie Wade, who works with the American Tobacco Harm Reduction, said she thinks vaping is less dangerous than smoking tobacco. “Of course the youth are a priority, but what about the one billion adults smokers that will die by the end of the century? Taking away the option of flavored vapor liquid prevents adults from stepping away from deadly cigarettes,” said Wade, who noted that she is not affiliated with big tobacco companies. Vaping was the only thing that finally allowed her to quit after being a smoker for 21 years and trying multiple methods to quit, Wade said. “Even the love of my own child that grew within me couldn’t stop me from picking up a cigarette again,” said Wade, saying that she had only been able to quit smoking for the time she was pregnant with her two daughters and five weeks after having them. The group, a branch of Let’s Be Real San Francisco, which advocated for the same issue in that city, distributed postcards reading “Bans don’t work—Just look at the failed War on Drugs” to encourage Oakland residents to contact their councilmember by phone or e-mail to urge them to stop the ban. Rojas said that once in effect, the ordinance will still allow residents to purchase and smoke flavored tobacco products from neighboring cities without legal consequences. “We’ve seen data, and history has shown people will find a way to find that product,” said Rojas. He said that prohibition will result in the creation of an unregulated market. “History has shown that’s what’s going to happen,” he added. Rojas said Let’s Be Real Oakland members had met several times with Campbell Washington and Reid within the last seven months. “They are not in support of retailers,” said Rojas. When reached by phone and email, neither councilmember provided Oakland North with a comment on the ban or Rojas’ criticisms. According to Rojas, the group represents small neighborhood businesses and groups such as the Arab American Grocers Association. But major funding for his group comes from a tobacco company. According to a campaign disclosure statement known as the California Form 460, Let’s Be Real San Francisco received $685,170.77 in 2017 from Reynolds American Incorporated, an arm of the R.J. Reynolds Tobacco Company. Mohamed Hassan, is the owner of Telegraph Quality Market on Telegraph in Oakland, a convenience store that has been owned by his family for 40 years. “It’s going to be about at least 40 percent of our tobacco business, or more than that. Probably half,” said Hassan about the profit he expects to lose after the ban takes effect. Hassan does not have a plan yet about what he and will do to recover from the loss. He added the profit margin on tobacco is very low already. He noted that the ban will only apply to shops where the tobacco products make up less than 70 percent of their total products. This means tobacco shops will still be able to sell flavored tobacco products. “Either play it fair with everybody, or don’t,” said Hassan. According to the Alameda County Public Health Department, between 2013 and 2015, the majority of deaths in Oakland, or 55.38 percent, were caused by chronic diseases possibly related to tobacco exposure. These include respiratory illnesses such as tuberculosis, influenza and pneumonia, chronic lower respiratory disease, cancer, heart disease, and stroke. This number is about five times greater than the number of deaths caused by suicide, homicide, and unintentional injuries combined during that same amount of time, which accounted for almost 1 out of 10 of casualties in the city. In California, laws to prevent smoking among youth have already passed. In 2017, Proposition 56 increased the tax rate from 27.3 to 65.08 percent per cigarette pack, and Senate Bill 7 in 2016 increased the legal age to purchase tobacco products from 18 to 21. Vaping advocates argue that the ban of e-cigarette products will not address the issue of children smoking cigarettes, because they say vaping does not lead to cigarette smoking. “That’s sort of saying that kids are going from using smart phones to using phone booths,” said Stefan Didak, founder of the non-profit Not Blowing Smoke, a vaping advocacy group that was in alliance with the Let’s Be Real campaigns. Let’s Be Real Oakland holds plans to request a referendum to the city after gathering signatures on a petition. “We’ll see what the next step will be,” said Rojas. Said Hassan, cashier at Telegraph Quality Market, charges a customer purchasing flavored cigarettes on Thursday, Sept. 22, 2017, in Oakland, California. The prohibition of sales of flavored tobacco products that will take effect in 2018 will impact the store owned by his family directly. Camel Menthol cigarettes at De Lauer’s Super News Stand in Oakland, California. The prohibition of sales of flavored tobacco products that will take effect in 2018 will impact this store. 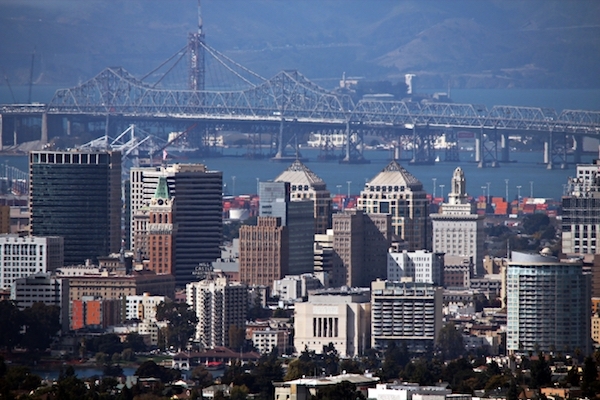 Good for Oakland, and compliments to the journalist author for a well/written comprehensive story that includes the significant argument that the ordinance is promulgated as an issue of social justice. I am not a young person and I have been smoking for 65 years . This ban is effecting my right to choose , witch seams to me to be unconstitutional . Oakland, unlike other cities in this area didn’t even give it’s citizens a chance to vote on the matter . I am a 70+ year old man that wants my voice to be heard ! Stop taking away my rights ! I didn’t finish the arrival I stopped when it said it will stop young people from smoking. If your aim is to stop young ppl from smoking ban them outright menthol non menthol. I just experienced this for first time Monday when I couldn’t buy my menthols. Okay with out a blink of an eye I said give me camel blues. This doesn’t help the problem you’re trying to solve, now I can buy menthols in city I live in bring them to oakland and sell them for double most likely.